So, apparently, someone did a version of Scarface as a kids’ elementary school play. At least, that’s the theory behind this video that’s going viral even as we speak. Imagine it, little kids running around with plastic blaster guns, saying “fudge” every other word, and generally being completely inappropriate. No wonder the video is starting to pop up everywhere. Check it out. I have to admit I’m getting flashbacks the whole time to that movie where little kids played gangsters and used pies to stage gun fights, Bugsy Malone. Now, I’m not a prude, so I think this is pretty hilarious. I mean, the stuffed tiger on the floor by the desk? The pile of popcorn to replace Tony Montana’s cocaine? That’s all pretty funny. 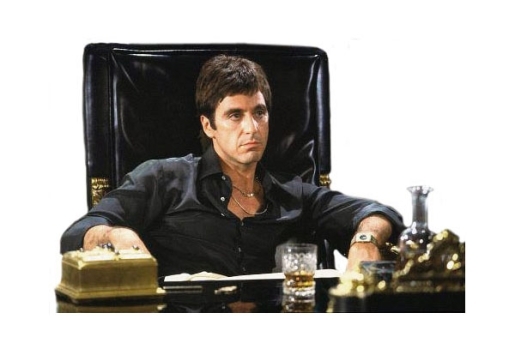 It’s a little hard to understand what Tony Montana Jr. is saying most of the time, thanks to his bad Pacino accent (which is something it has in common with the adult version of Scarface). Still, this is funny stuff!